More than £260m is to be cut from the policing budget over the next four years. 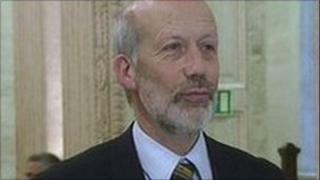 Northern Ireland's prison service will have to find savings of just over £65m. The figures are in a draft budget proposal published by the Department of Justice on Thursday. Details of the cuts come at a time when the PSNI is asking the Treasury for additional emergency funding of £200m to combat the dissident republican threat. The Department of Justice has a budget of more than £4.5bn for the next four years. But, like other Stormont departments, Finance Minister Sammy Wilson has asked it to make savings. The vast majority of the justice budget is spent on policing and prisons, and they will bear the brunt of the cuts outlined in the department's draft proposals. The PSNI will have a budget of more than £3bn during the next four years. But it's also being asked to make savings of just over £260m during that time. The prison service will have a budget of more than £500m for the next four-year period. But it will have to deliver savings of just over £65m. Justice Minister David Ford said: "What we have done is to ensure that we get the best possible protection for front-line services. "There is a lot of work being done to trim the back office costs and to look at efficiency in that kind of area."